Imported unbroken by his owner Mark Todd, MAYHILL showed so much potential as an event horse that despite his outstanding National Hunt breeding his career has been in the event world. 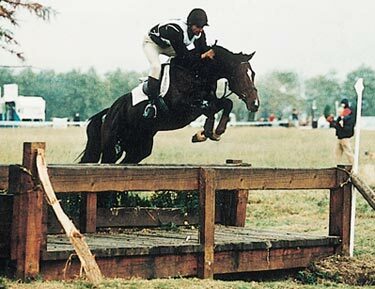 MAYHILL competed One and 3 Day Eventing from 1990, upgrading quickly to Advanced. 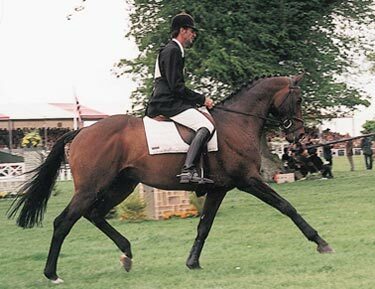 At Saumur Three Day Event in 1994 he was 6th and was Mark’s reserve entry for the Hague World Championships, also that year finished 9th in the British Open Championship at Gatcombe Park. He was placed again at Gatcombe in 1995. He retired to stud sound in 1996 – a decision prompted solely by the number of mares requiring his services! In MAYHILL’s entire career he never had a jumping penalty cross country. Mayhill was Judged Champion at the 1993 British Warmblood grading and was fully approved by the Anglo European stud book and the Sport Horse Breeders (GB); being considered the perfect type of thoroughbred for competition horse breeding; Dr Schenkenberg the renowned judge called him “The Thoroughbred all of Europe is looking for”. His foals have been accepted by the Zangersheide Studbook and he has been used by mare owners in England, Ireland, France, Germany and Holland. Over the years New Zealand bred horses have had an incredible impact on World Class Three Day Eventing – STUNNING, MESSIAH, DELTA, READY TEADY, SILENCE, JAYBEE, EZE, CHARISMA, BOUNCE the list goes on and MAYHILL has bred that tough, New Zealand class. MAYHILL has been one of the country’s most popular stallions for several seasons - his oldest offspring were born in 1993 and they are enjoying enormous success. PRIMMORE’S PRIDE (Pippa Funnell) was probably the most impressive event horse in the World in 2003 - winning both Lexington and Burghley ****’s, and providing Pippa Funnell with two of her three wins needed to take the Rolex Grand Slam of $250,000 - the biggest prize ever seen in eventing. PRIMMORE’S PRIDE’s career has been amazing, he won the Burghley Young Event Horse Final at 5, was 1st at Lion D’Angers CCI 2000, 4th Punchestown 2000, 4th Blenheim 2001, 2nd Punchestown and 6th Burghley 2002 – he also won the British National Championship at Gatcombe that year. in 2005 he added Badminton to his triumphs – becoming the only horse to win all of the big 3 - Lexington, Burghley and Badminton. Mayhill’s offspring keep appearing with success at National and International level – DIAMOND MAGIC won Boekelo, other names in the form have been PRIMMORE’S PIONEER, MATCHPLAY, BEN AUK, BRIMLEYS FEDORA, MAYFLOWER and of course Ruth Edge won the British Open Championship at Gatcombe in 2008 with MAYHEM III. Again in 2010 new MAYHILL names were still appearing in the form. Since then the MAYHILL damline is proving influential - the legacy goes on! and of ZEALENDO (formally WHO’S ZOOMING) Show Jumping at Grand Prix Level in the USA. His Grandsire SEA BIRD is one of racings legends - winner of the Prix de l’Arc de Triomphe himself, he was one of the ‘Sires’ of the 20th century, father of SEA PIGEON – winner of the Cheltenham Champion Hurdle and many other winners including the legendary ALLEZ FRANCE. 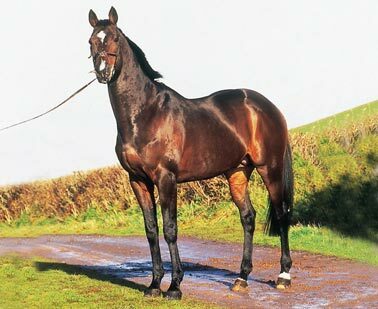 His Dam’s Sire OAKVILLE was Champion Broodmare Sire 1985-86, and father of Dual Colonial Cup winner GRAND CANYON.